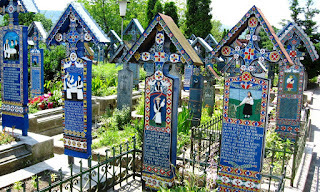 In Sapanta, Transylvania, Romania, there is a wonderful and unique cemetery known as Cimitrul Vesel (The Merry Cemetery). This small community is gaining fame. 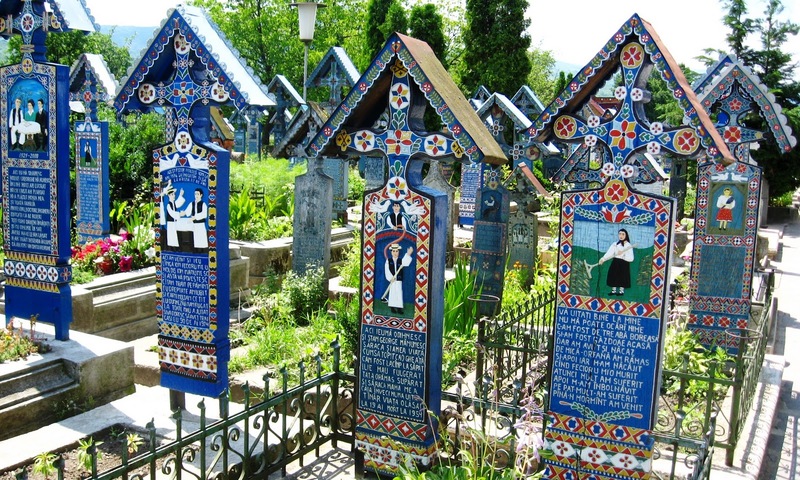 This is due to the colours on the tombstones, and the element of truth in the epitaphs, this cemetery shows a powerful and unique way of dealing with death. This gem of a place is mentioned in Atlas Obscura, which has some of the most interesting and, obscure places one can visit. 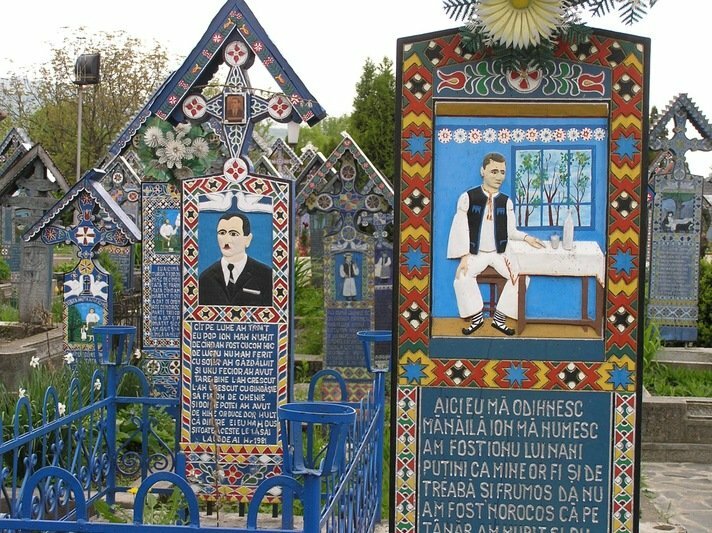 To say that a cemetery is "merry", is at best ironic, but it is the colourful blue tombstones themselves which add to the bizarre, and, more human element to this area. It is a small village, and as with many villages the world over, everyone knows something about everyone else. In this case, there is no need to "hide" from the fact that you died, or even the manner of your death, nor to hide from the fact that you were not perfect in life. This carving the tombstones for the dead is the labour of love for Stan Ioan Patras, who began his woodworking for the cemetery and even craved his own tombstone. His apprentice, Dumitru Pop, has carried on his work after Patras' death in 1977. 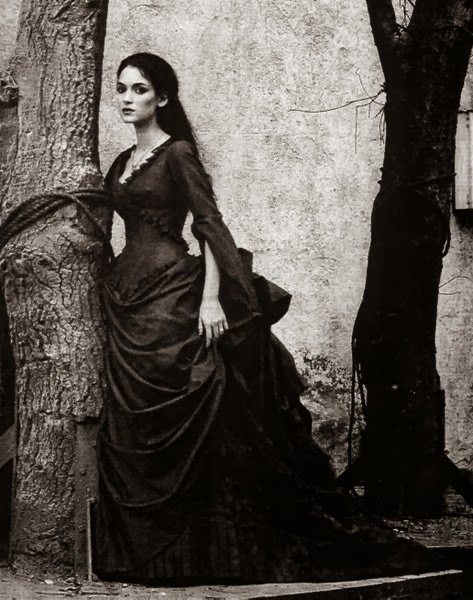 Death, or how many of the European communities view it, is a passage where it is a sad event. One does not see this person again. Either for good or bad. The Merry Cemetery takes a different point of view for many years. The older tombstones are less ornate and contain little of what might interest people. 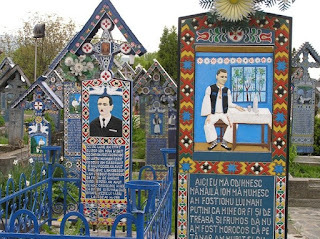 They do contain dates of birth and death and the like, and possibly a kind epitaphs, but the tombstones after the 1930s are different, and unique and give the dead a means of being more alive than simply a memory. Patras himself made poems or verses on the tombstones, and each had a piece of the person's life- or moments of death- on the head. It is not a happy place, but it give life to the dead. 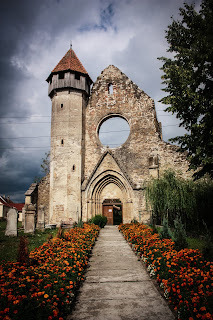 Even more important it harkens back to the Dacians who held a view that death was a step to a better life, one which was to be filled with joy and anticipation. In this, the village has done an amazing job at portraying to people who come and visit. 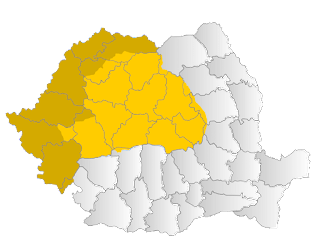 As a note to tourists, this is a small community, one which is hard to find on a map bigger than Transylvania, so knowing a bit of Romanian will help. Many recommend that a person has a guide, as to better understand the poems and the people who created them. One of those I found it in a book, and had to blog about it.